Download "Plumas Sierra Solar Rebate Program Guidebook 2015"
1 Plumas Sierra Solar Rebate Program Guidebook 2015 Plumas Sierra Rural Electric Cooperative (PSREC) is offering rebates to encourage the installation of high quality solar photovoltaic (PV) systems in California s Senate Bill 1 (SB1), passed in August 2006, set a statewide goal to add 3,000 MW of new PV systems over ten years. The outcome of the program is examined at the end of each year and appropriate revisions are made to ensure progress toward program goals and equity among rate classes. 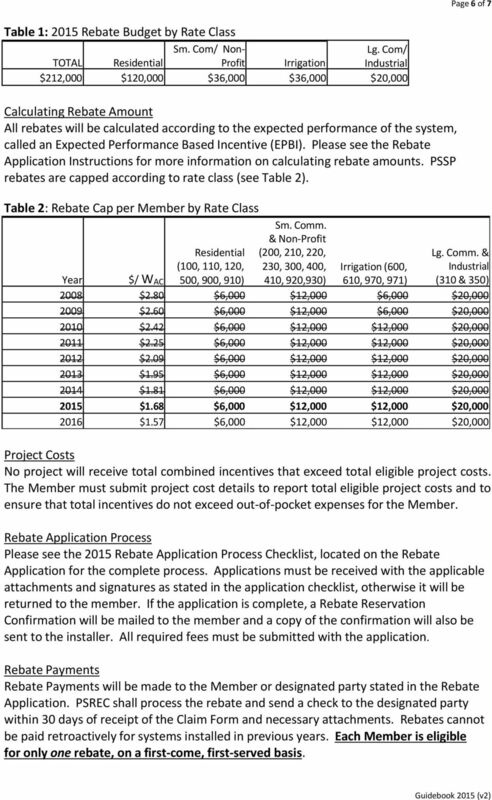 A rebate budget will be made available through 2016 with rebates allocated across rate classes (see Table 1). Rebate rates will decline by 7% each year. In order to make these rebates available to our members, a 1.05% Solar Charge is billed to all members, which is added to the existing Public Benefits Charge (3.9% total). 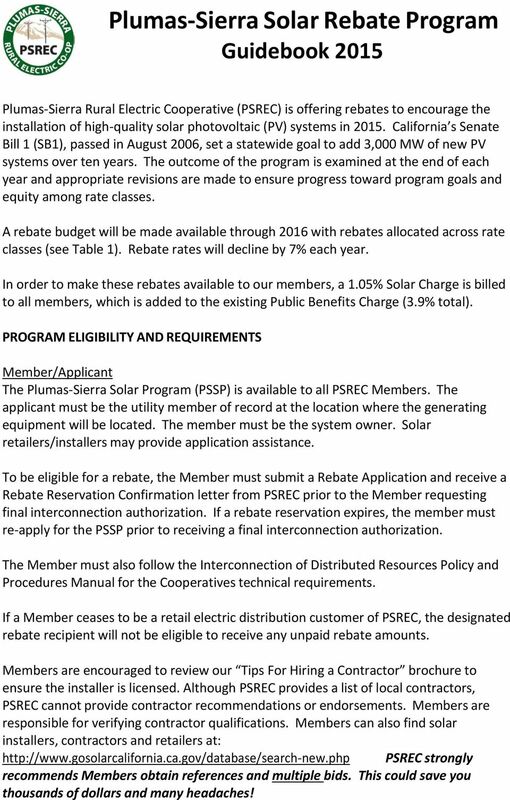 PROGRAM ELIGIBILITY AND REQUIREMENTS Member/Applicant The Plumas Sierra Solar Program (PSSP) is available to all PSREC Members. The applicant must be the utility member of record at the location where the generating equipment will be located. The member must be the system owner. Solar retailers/installers may provide application assistance. To be eligible for a rebate, the Member must submit a Rebate Application and receive a Rebate Reservation Confirmation letter from PSREC prior to the Member requesting final interconnection authorization. If a rebate reservation expires, the member must re apply for the PSSP prior to receiving a final interconnection authorization. The Member must also follow the Interconnection of Distributed Resources Policy and Procedures Manual for the Cooperatives technical requirements. If a Member ceases to be a retail electric distribution customer of PSREC, the designated rebate recipient will not be eligible to receive any unpaid rebate amounts. Members are encouraged to review our Tips For Hiring a Contractor brochure to ensure the installer is licensed. Although PSREC provides a list of local contractors, PSREC cannot provide contractor recommendations or endorsements. Members are responsible for verifying contractor qualifications. Members can also find solar installers, contractors and retailers at: new.php PSREC strongly recommends Members obtain references and multiple bids. This could save you thousands of dollars and many headaches! 2 Page 2 of 7 Members should compare their annual energy usage to the projected PV system output to ensure the proposed system meets their needs. Installer To be eligible for a rebate, all systems must be installed by appropriately licensed contractors in accordance with rules and regulations adopted by the State of California Contractors State Licensing Board (CSLB). Contractors must have an active A, B, C 10 license, or C 46 license for installing PV systems. Roofing contractors with a current C 39 license may place PV panels in accordance with the limitations of their license; however, electrical connections shall not be made by a roofing contractor. Although not required, installation contractors are encouraged to become certified by the North American Board of Certified Energy Practitioners (NABCEP). 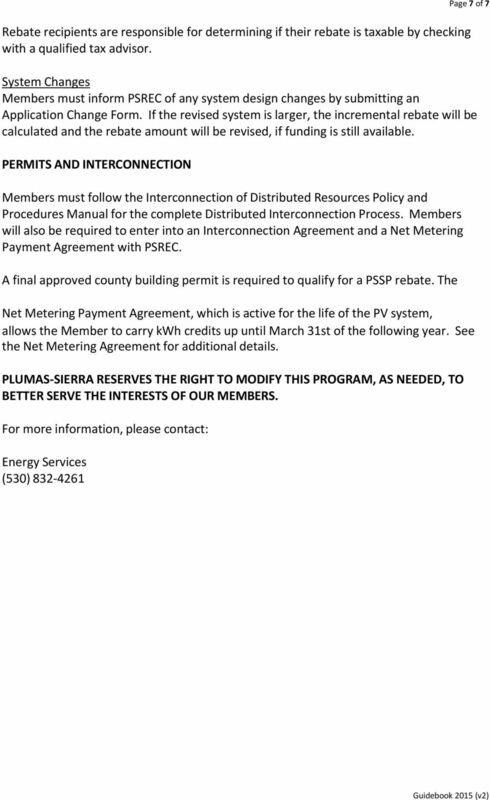 PSREC also recommends that the installer be registered with Go Solar California and meet their pre screening criteria. For more information, visit: In all cases, systems must be installed in conformance with the manufacturer s specifications and all applicable electrical and building codes and standards. 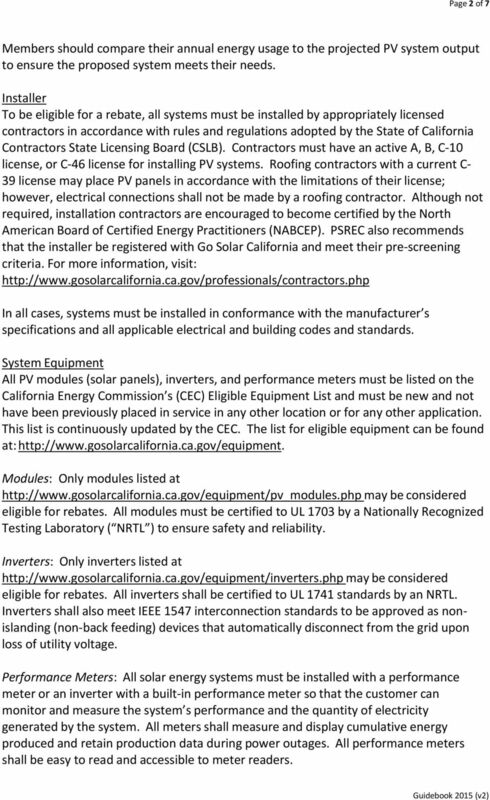 System Equipment All PV modules (solar panels), inverters, and performance meters must be listed on the California Energy Commission s (CEC) Eligible Equipment List and must be new and not have been previously placed in service in any other location or for any other application. This list is continuously updated by the CEC. The list for eligible equipment can be found at: Modules: Only modules listed at may be considered eligible for rebates. All modules must be certified to UL 1703 by a Nationally Recognized Testing Laboratory ( NRTL ) to ensure safety and reliability. Inverters: Only inverters listed at may be considered eligible for rebates. All inverters shall be certified to UL 1741 standards by an NRTL. Inverters shall also meet IEEE 1547 interconnection standards to be approved as nonislanding (non back feeding) devices that automatically disconnect from the grid upon loss of utility voltage. Performance Meters: All solar energy systems must be installed with a performance meter or an inverter with a built in performance meter so that the customer can monitor and measure the system s performance and the quantity of electricity generated by the system. All meters shall measure and display cumulative energy produced and retain production data during power outages. All performance meters shall be easy to read and accessible to meter readers. 3 Page 3 of 7 Ground mounted systems: If system is not roof mounted, the system must meet NESC clearances and all property easements must be disclosed. Rebate applications must include a plot plan denoting system location in relation to existing electrical service and existing easements. Additionally, if trenching is required, installers are required to call 811 to locate underground utilities. If you don t Call Before You Dig, you may disrupt service to an entire neighborhood, harm yourself and those around you and potentially incur fines and repair costs. Calling 811 is free and helps prevent undesired or dangerous consequences. PSREC reserves the right to reject a system from interconnection if we deem it is unsafe. System Size To be eligible, the system must be sized so that the amount of electricity produced by the system primarily offsets part or all of the member s annual electrical needs at the site of installation. Members should compare their annual energy usage to the projected PV system output to ensure the proposed system meets their needs. For systems 5kW AC or less, substantiation of system sizing is not required. For systems larger than 5kW AC, the Member must show justification of the system sizing with the submittal of the initial application. The maximum system capacity should be calculated as follows: Max Capacity (kw AC ) = Previous 12 months usage (kwh/yr) / 1577 (hrs/yr) For systems greater than 5kW AC, and less than or equal to 10kW AC, where historical electrical load cannot be determined, on site electrical load may be determined using the calculation of 2 watts per square foot. For systems greater than 10kW AC with existing electric usage history that does not reflect the Member s expected expanded consumption, the Member must include an electrical load estimate, utilizing an electric load calculation with corresponding equipment schedules or detailed engineering calculations. The maximum system size for the PSSP rebate is 25kW. Please inquire regarding interconnecting PV systems larger than 10kW. Shading Analysis A shading analysis is required and must be attached to all applications. For shading from existing obstructions, shading conditions shall be verified using a solar assessment tool, such as a Solar Pathfinder or Solmetric report. Monthly shading derate factors must be recorded for the system (100% = no shading, 0% = total shading). 4 Page 4 of 7 If a proposed installation location has no shading, a photo of the solar assessment tool documenting the clear solar window and a photo taken of the southern exposure from the proposed installation site must be submitted. Shading analysis is subject to verification by PSREC staff. Energy Efficiency For residential sites, the Member must include the Residential Energy Efficiency Checklist along with the application. It is recommended that the Member implement efficiency measures prior to PV system installation. For commercial sites, the Member should consider contracting for an energy efficiency study prior to PV system installation. Members may be exempt if their home complies with the 2001 or 2005 CA Title 24 Energy Code, (submit a copy showing compliance with CF 1R Form, prepared by a Certified Energy Plans Examiner). Warranty All systems must have a minimum 10 year warranty provided in combination by the manufacturer and installer to protect the purchaser against defective workmanship, system or component breakdown, or degradation in electrical output of more than 15 percent from their originally rated electrical output during the 10 year period. The warranty must cover the PV modules and inverters, and provide for no cost repair or replacement of the system or system components, including any associated labor during the warranty period. Performance and Permanency Equipment is intended to be in place for the duration of its useful life. Only permanently installed systems are eligible for rebates. PV systems must demonstrate adequate assurances of both physical and contractual permanence and are subject to verification by PSREC staff. Service Entrances, Metering and Data Collection PSREC shall install, own, and maintain a kilowatt hour meter capable of registering the bi directional flow of electricity. Proposed modifications to the service entrance must be approved by PSREC. All service entrance and disconnects must be EUSERC approved. Members must notify PSREC at least six weeks prior to system interconnection to request a residential net meter. For 400 amp residential services and for all commercial services, please contact PSREC at least 10 weeks prior to proposed interconnection to ensure service panel compatibility. In some cases, 400 amp panels will have to be changed at the member s expense to 320 amp. Members may be required to provide cumulative production data from their performance meter on an annual basis. 5 The installer must install a separate performance meter on the member side of the system (see System Equipment above). Utilizing inverters that have a built in performance meter is acceptable. Page 5 of 7 Fees The Member is responsible for a non refundable application fee; see the Distributed Generation Policy and Procedures Manual for the applicable fee. A service inspection/ meter change out fee is also required. Please contact us for current fee schedules. Site Inspections and System Verification To be eligible for PSREC Solar Program rebates, Members must agree to provide PSREC, and/or third parties contracted by PSREC, access to the site and any available data and information collected on the system. PSREC may conduct a System Interconnection Inspection in order to verify that the project is installed as represented in the application, is operational, interconnected and conforms to the eligibility criteria of the PSSP and the Interconnection Agreement. At PSREC s discretion, the Installer may be required to be present at the Interconnection Inspection. PV systems cannot be energized prior to PSREC s inspection/meter exchange. 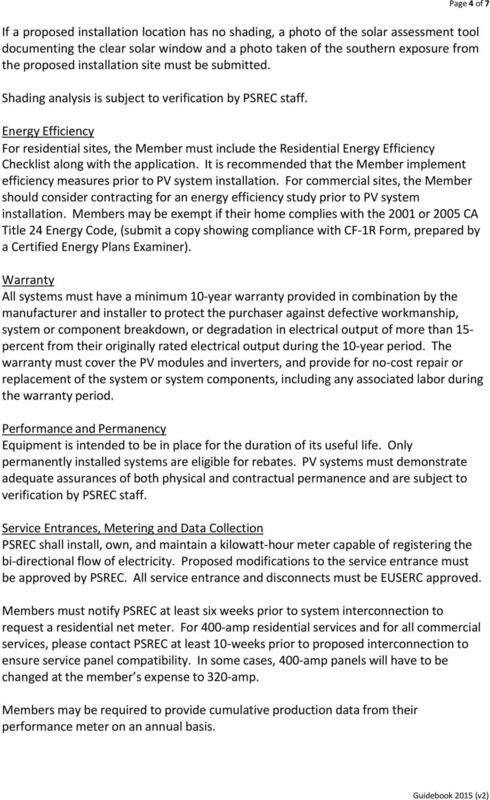 PSREC reserves the right to disqualify installers from future PSSP program participation and can prohibit them from interconnecting additional systems within the PSREC service territory for gross negligence, fraud (including but not limited to misrepresenting system components or shading analyses), uncorrected mechanical failures within 60 days, installing systems found to be dangerous, or other actions that intentionally mislead PSREC or its Members. 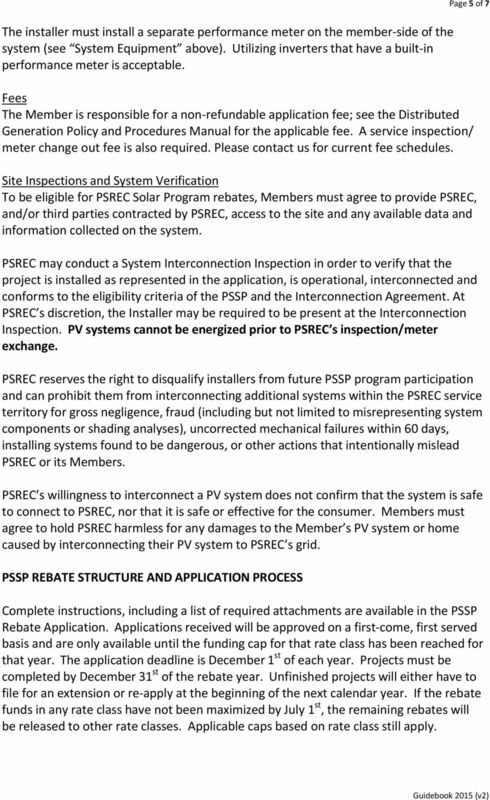 PSREC s willingness to interconnect a PV system does not confirm that the system is safe to connect to PSREC, nor that it is safe or effective for the consumer. 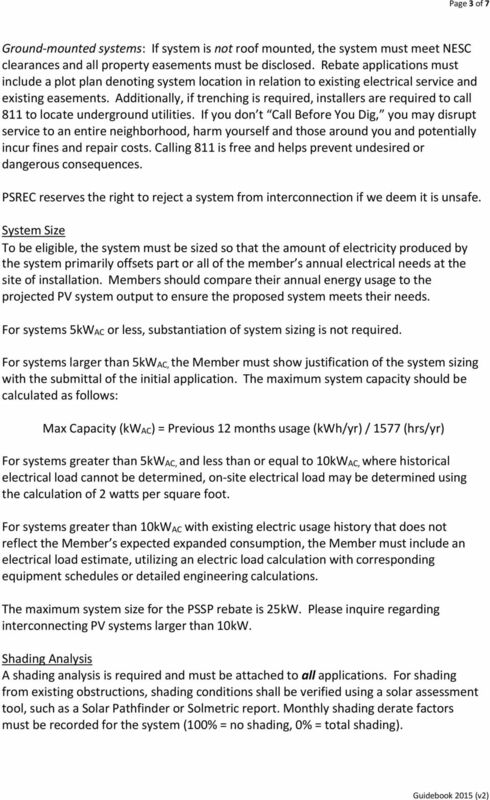 Members must agree to hold PSREC harmless for any damages to the Member s PV system or home caused by interconnecting their PV system to PSREC s grid. PSSP REBATE STRUCTURE AND APPLICATION PROCESS Complete instructions, including a list of required attachments are available in the PSSP Rebate Application. Applications received will be approved on a first come, first served basis and are only available until the funding cap for that rate class has been reached for that year. The application deadline is December 1 st of each year. Projects must be completed by December 31 st of the rebate year. Unfinished projects will either have to file for an extension or re apply at the beginning of the next calendar year. If the rebate funds in any rate class have not been maximized by July 1 st, the remaining rebates will be released to other rate classes. Applicable caps based on rate class still apply. 6 Page 6 of 7 Table 1: 2015 Rebate Budget by Rate Class TOTAL Residential Sm. Com/ Non Profit Irrigation Lg. Com/ Industrial $212,000 $120,000 $36,000 $36,000 $20,000 Calculating Rebate Amount All rebates will be calculated according to the expected performance of the system, called an Expected Performance Based Incentive (EPBI). Please see the Rebate Application Instructions for more information on calculating rebate amounts. PSSP rebates are capped according to rate class (see Table 2). Table 2: Rebate Cap per Member by Rate Class Residential (100, 110, 120, 500, 900, 910) Sm. Comm. & Non Profit (200, 210, 220, 230, 300, 400, 410, 920,930) Lg. Comm. & Industrial (310 & 350) Irrigation (600, Year $/ W AC 610, 970, 971) 2008 $2.80 $6,000 $12,000 $6,000 $20, $2.60 $6,000 $12,000 $6,000 $20, $2.42 $6,000 $12,000 $12,000 $20, $2.25 $6,000 $12,000 $12,000 $20, $2.09 $6,000 $12,000 $12,000 $20, $1.95 $6,000 $12,000 $12,000 $20, $1.81 $6,000 $12,000 $12,000 $20, $1.68 $6,000 $12,000 $12,000 $20, $1.57 $6,000 $12,000 $12,000 $20,000 Project Costs No project will receive total combined incentives that exceed total eligible project costs. The Member must submit project cost details to report total eligible project costs and to ensure that total incentives do not exceed out of pocket expenses for the Member. Rebate Application Process Please see the 2015 Rebate Application Process Checklist, located on the Rebate Application for the complete process. Applications must be received with the applicable attachments and signatures as stated in the application checklist, otherwise it will be returned to the member. If the application is complete, a Rebate Reservation Confirmation will be mailed to the member and a copy of the confirmation will also be sent to the installer. All required fees must be submitted with the application. Rebate Payments Rebate Payments will be made to the Member or designated party stated in the Rebate Application. PSREC shall process the rebate and send a check to the designated party within 30 days of receipt of the Claim Form and necessary attachments. Rebates cannot be paid retroactively for systems installed in previous years. Each Member is eligible for only one rebate, on a first come, first served basis. Dear Contractor: If you have any questions about the Program or your Application, please feel free to call our office at 753-8292.